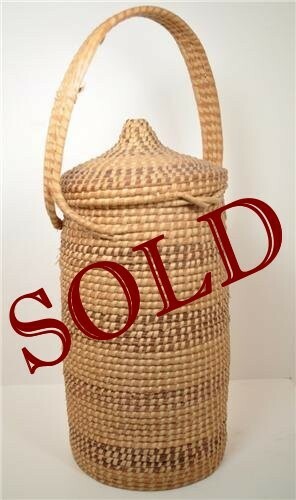 Here is a fabulous and quite tall Sweetgrass Hand Made Antique Basket. This one is in remarkable condition with only a few frays in the needles themselves. A Double loop holds both the lid and the basket itself intact. and all is attached quite well. There are some frays on the handle and there was at one time a latch that is no longer there (see photo for where this was). No way distracting from the basket. The hand work on this piece is remarkable being one of the finest pine needle artifacts we have ever found in our treasure hunts. If you've been looking for the perfect Sweetgrass Basket Centerpiece...this is your find!